For those of you who are regular visitors to this site, you know how often I stress making 550 Paracord an essential item in your bug-out-bag, survival kit, car and so on — the more the better. Given the strength of paracord (550 lbs of tensile strength) and its many applications (tiedowns, lashings, shelter building, friction fire making, fishing line and nets, splints, repairing equipment, tooth floss and many more) it’s one of those things you should never leave home without. 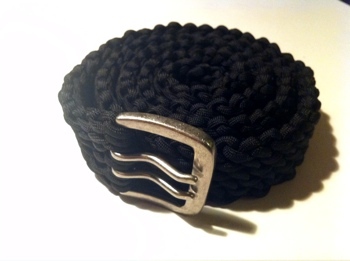 Originally I had posted an article about the first paracord belt that I made. Although you get about 100 feet of paracord, it was difficult to unwrap if you needed it quickly in an emergency and most of all it looked dang ugly — not something I wanted to be wearing, which I didn’t. At that time I began looking for other belt ideas. I had three requirements. One, it had to be able to unravel quickly. Two, it had to contain at least 100 feet of paracord. And three, it had to look nice enough that I’d actually wear it. The cobra weave for example, while it looks great, is not ideal for quick access and you don’t get around 100 feet of cord. Iv’e been using this style of Paracord belt for a while now, I love it. I also found that by modifying the beginning of the belt you can make good gun slings out of this stitch. I also came up with a way to add a small loop any where in the middle of the belt to add a carabiner, by skipping a loop. The only down side i found with this style of stitch is it tends to stretch out under load, making its belt function iffy at times. Thanks for the comments. I’d love to see how you add the loop. Do you have a site or somewhere that you can post that? I don’t have any way i can post it. To add the attachment loop you have to start 1 loop wider than you want to end with. you will want to place the attachment loop at least a couple rows from either end of the belt. After you’ve twisted your loops and before you pass through them with your working end of the rope, you attach your carabiner to one of the center loops, then proceed to pass the working end through all the loops except the 1 you’ve attached your carabiner to. When you’re tightening the loops leave the 1 with the carabiner as loose as you desire it will be your attachment loop. If you have an email i could send you some pictures of how i did it, sorry i’m not terribly tech savvy. Thanks for the details. I’d love to see pics. If you can send them to tacticalintelligence.net [at symbol] gmail [dot] com I’ll be sure to post them. Thanks for posting. I will be attempting to make one of these belts soon. It’s been on my list of things to learn for a while, and this makes it easier. Thanks again! You’re very welcome. I know how it is. It’s been on my todo list for quite some time as well and finally now just got to it. Let us know how yours turns out. This is a horrible idea. Your belt is there for more than to hold your pants up. Although holding my pants up is key–in any real combat environment I use suspenders anyways. It allows you to keep your pants up without having to cinch your belt down, thus allowing for proper blood flow and lactic acid to dissipate. A well made cobra/riggers belt offers advantages for carrying, using the belt as a hasty harness, etc. 550 cord has its place, on the body is not it. What happens if you need to use a ton of lashings/etc and now you’ve got no belt and need to keep moving? Same thing with super high speeds who put their ID tags on em. Hopefully you don’t lose your head or get grabbed by a bad dude and not be able to break away. And I hope your sweet paracord bracelet doesn’t get caught on anything, because whatever it is, you’re hand is going with it. Additionally, I keep other survival items behind the velcro on my riggers belt. The same tenants which guide common sense in combat frequently apply survival situations. Appreciate the comments but I’m still keeping the belt. However you make a good point with the bracelet and will give that one some thought. I’m thinking a breakaway clip that would prevent the bracelet snagging on something and taking my hand with it. Thanks again! Some good feedback. How do you get the tapered end on the belt? The stitch actually creates it when you tighten it at the end. Why not make a pair of suspenders and a belt in the slatts fashion? Just made a rifle sling with super thick (5mm or about 1/5″) dollar-store paracord-like rope using just two loops plus the pull-through loop. Worked like a charm, only needed about 12 yards or so. 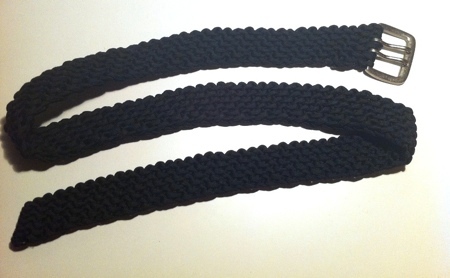 The resulting strap is well over an inch wide and nice and elastic, really comfortable. I agree that the resulting “belt” is far too elastic to be very effective as a pants-belt but it sure made a pretty decent sling. And it’s not like you’d have to be without your sling to use the rope, you’d just save a yard of it for a single-cord sling and use the other 11 for your other needs. The point is now I don’t have to remember to carry rope, it’ll just be there with me. Even as a means of storing rope in your pack, this is a great knot. The resulting shortened rope can’t get tangled in storage and it dispenses flawlessly by just pulling what you need out from an end as you need it. The video was the best and least confusing of all the ones that I found. Thanks Tac Int! I’m looking to buy some 550 cord but how do I make sure that it is quality cord and not some knock off? Using this method, about how long a belt would a 100 foot section of paracord produce? Thanks in advance. In my experience, 100 feet makes about a 38 inch belt. This is with six loops and after stretching the belt some. So when i saw this it reminded me of my mother knitting, making a mistake and then unravelling the mistake. Lo and behold- using paracord and thick needles, make a 5 stitch “knitted” belt. Once you remove the loops from the “needle” the paracord just totally unravels just liek a Slatts belt. Now i just need to figure out how to sell the idea of guys knitting with paracord! Good observation. I believe the Slatt’s knot was in fact inspired by knitting. I’ve starrted this belt. I have about 6 inches made. The left side seems to be longer. With each row of loops the left side grows longer, I can’t keep them straight across. What am I doing wrong? You’re doing it right, so no worries. It appears to be growing only in one direction but as it gets longer and you pull it a bit you’ll notice that it is straight but the pattern is slanted. I can’t make this “weave” work anyway. I can’t work out how to tighten the rows up, and each row gets successivly looser. Pulling on the live end just makes the belt unravel. Especially as an EDC, I’ve gotten away from putting anything on a belt. It’s awkward, and does not lend itself to daily work (my job does not require a signficant carry of equipment on-body). Sure, this belt may not be ideal for combat, hiking, camping… But being able to EDC over 100′ of paracord as an item of clothing I already wear for emergency purposes? I don’t call that a horrible idea. Where do i get the buckle? If you’re looking for standard buckles, a good resource is: http://www.moonshineleather.com/beltbuckles.cfm. Otherwise if you want something more custom, just do a google search on “men’s belt buckles” and you’ll find some pretty crazy ones. Good luck! Do this while watching TV!?!? You must have watched all 550 minutes of Planet Earth twice before the belt was done. I am using break-away 3/8 buckles to make my bracelets. I believe they seperate at 20# but not sure. Have you seen how to make a bracelet with 2 separate cobra stitches joined side by side? For those of you who want the belt and para cord check out the Tactical IOA Paracord Belt in the NRAStore.com You can unravel about 40 feet of cord and still have a usable belt afterwards. You have to take the cord coming to the inside and cross it over to the other stitch. I ususally use the back cords and always cross the same cord on the bottom(from the same side). This gives a better looking weave. If done right you have a crossover on one side of the weave and straight lines on the other. I have done these for wide bracelets and also for dog collars for larger dogs. I have one to make soon as my Mastador Sheperd pup is growing up and will need one. Actually he will get two, one in black to match him and his leash and another in blaze orange for when we go woods running. Oh my goodness, this made me laugh so hard I got dizzy. I just wanted to point out that even a foot of cord will hold your pants up. You just loop around two belt loops, tighten as much as you need, and voila! Hmmm.. I knit. I have para cord…. Wonder what size needle to use? This is actually very similar to a crocheted afghan stitch – minus the single crochet back across. I’m thinking about starting this today for my don. Might try using a crochet hook (size n?) to assist in pulling the bight through. I’ve made two of these belts now using paracord, with a six-loop stitch. On the first belt, I noticed the paracord had multiple twists due to all the loops facing the same direction. You don’t notice this on the video, since it uses braided cord. I spent a lot of time getting the twists out, and realized that I would have a bunch of twisted cord if I had to unravel the belt. So, I alternated the twists on the second belt. This yielded a completely different yet equally attractive design. The belt was also both narrower and longer. I would recommend that second technique as both faster and more usable if needed. Using 100 feet of paracord on both, the first belt was around 41 inches and the second, 49 inches (after a bit of stretching out). I would also use an eight-loop stitch with the second technique to make it wider, which I estimate would result in about a 36-inch belt using 100 feet of paracord. I also started the second belt with two loops, then four loops and then went to the full six loops for the remainder. This made the buckle end straighter and easier to attach. I’ve got a few issues with this post. “Get grabbed by a bad dude and not be able to break away.” I think that applies to pretty much any belt. My leather belt I wear daily wouldn’t allow me to break away if someone grabbed it, nor would a rigger’s belt (unless a bad guy can pull me with 7000 lbs of force and not break my hips in the process). And about the paracord bracelet point: maybe if you’ve made the bracelet one loop of cord that has been connected to itself, but most are either a ball and loop or a clasp. Few clasps have a breaking strength higher than the force necessary to separate a hand from an arm, and I’ve learned from experience that those ball and loop ones will come undone if pulled on with sudden or substantial force. Also, if you’re so in need of line that you have to unravel your paracord belt to get it, your pants not staying all the way up is probably the least of your concerns. 3d printer models – 3d printer files, 3d модели для 3d принтера. Paracord Nuts? - Page 2 - XDTalk Forums - Your XD/XD(m) Information Source!